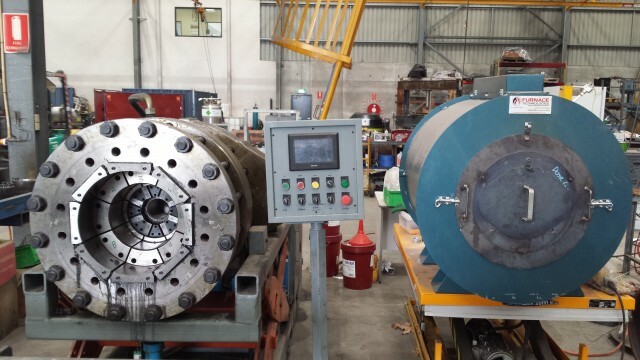 Bossong Engineering has once again increased their ability to serve customers by expanding their offered capabilities to include a dedicated swaging operation to their facilities in Welshpool and Broome. These state of the art swaging facilities have the ability to perform Tenaris – Wedge and Blue casings in Welshpool along with a range of VAM threads at our Broome facility. The sizes available are 2 7/8” up to 13 3/8” and the operation includes a furnace capable of reaching 1200°C for stress relief. In addition to this Bossong Engineering, also have a range of expanding tools that allow for a variety of custom jobs. These new features will allow Bossong Engineering to continue to serve customers demands in a timely and cost efficient manner. New swaging unit and furnace at Bossong Engineering’s Welshpool facility.